In this article, we will tell you how to install the plinth, and give tips that will help you achieve a professional result of your work. The plinth performs several functions at once: first, it closes the joint between the flooring and the wall, secondly, it protects the base of the walls from mechanical impact, thirdly, it bears a decorative load, provided, of course, that the installation work was done properly . 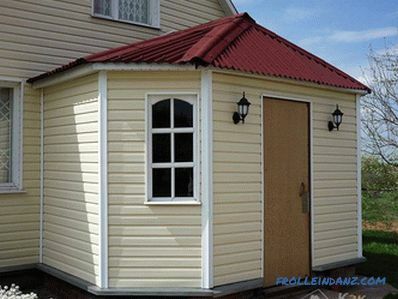 The plinth is supplied in a wide variety of colors, models and materials, so it is not difficult for you to choose the most suitable one according to your tastes and needs. The material of the plinth will largely determine the sequence of your actions on its installation. The most common materials for the manufacture of plinths are wood, MDF and plastic - it is about them that will be discussed in our article. Plastic plinth performs a dual function: it improves the appearance of the walls, hiding their curvature and other imperfections, and protects the base of the walls from all types of impacts. 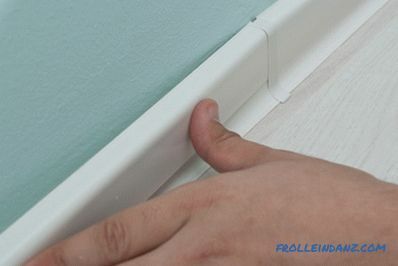 In most cases, the plastic baseboard is attached directly to the walls, not to the floor, as it is very flexible and is designed to hide the curvature of the wall. If you want to install a plastic baseboard, you have two options: either, using good glue, glue the baseboard to the walls of the room, or attach it with screws. We recommend that you choose the first option for plasterboard walls and the second option for brick walls. If you want to install a plastic baseboard on drywall, you must determine the places where you have to screw the screws. Make sure that between the baseboard and the wall, however, as well as between the baseboard and the floor, there is no gap. If you need to install a plinth on a brick wall, you must drill holes every 40 cm, insert dowels and fix the plinth with self-tapping screws. We recommend that you use a quality impact drill to make proper holes in the brick walls. Plinth plastic. A miter box or machine for cutting at an angle. 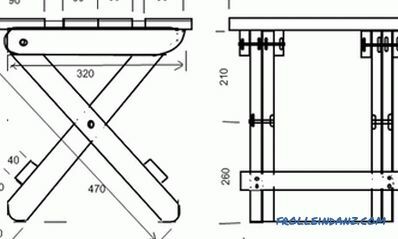 Fittings for plastic plinth (connecting elements, angles, caps). Hacksaw. Dowels and screws. Drill and drill bits. 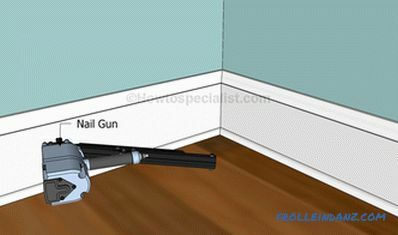 Use a vacuum cleaner to remove dust and other debris after drilling holes in the wall. To make precise cuts, you will need a hammer and a hacksaw. 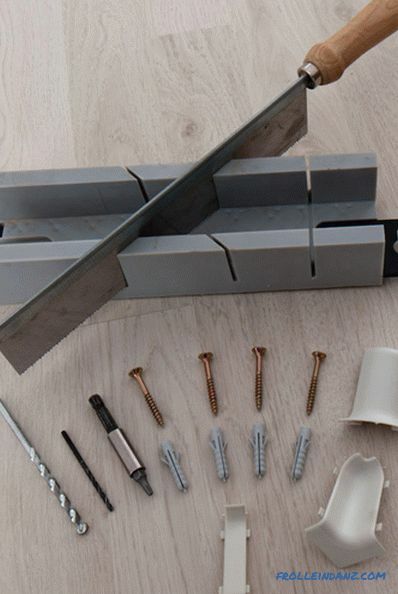 In addition, in this project we will show you how to fix plastic plinths to concrete walls, therefore, you will need to buy self-tapping screws, dowels and other necessary accessories (it is assumed that you already have a drill). We chose this path when implementing our project, but this does not mean at all that you must act in the same way. Tools and consumables needed to install a plastic baseboard. To begin with, you must measure the perimeter of your room to determine the required baseboard length. Do not forget to add 5-10% on waste when cutting. 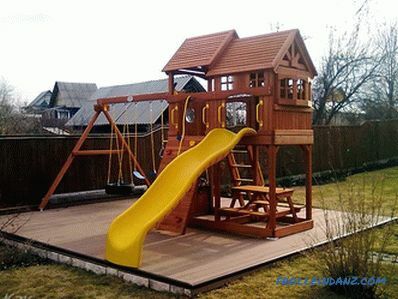 The plastic plinth comes in a large variety of shapes and colors, so it is best to pay attention to this aspect before making the final order. Tip: If you want to hide wires or cables, buy a plinth with a special cable channel. The baseboard of this model consists of two parts - the body in which you can hide the wiring, and the masking cover. Start the installation of the baseboard from the farthest corner of the room, installing solid pieces in the most prominent places in the room. In most cases, these seemingly minor details make the project more successful, so pay attention to them during work. 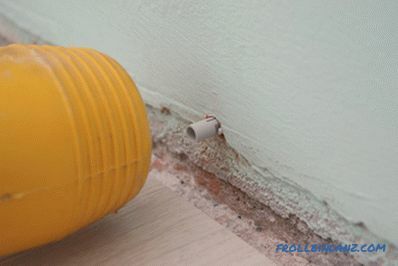 If you do not want to use glue to fix the baseboard, you must fix the bar with screws using every 25-40 cm, pre-drill holes in the wall and insert dowels. For this, you will need a drill and small drills. 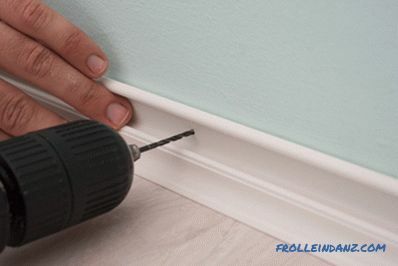 You must place the baseboard on the right place, making sure that there is no gap between it and the floor, and drill holes through the back wall of the baseboard every 25 cm. Tip: Do not drill deep holes in this stage wall - you just have to use a drill to mark places where you need to install dowels. Drilling holes through the wall of plastic plinth. 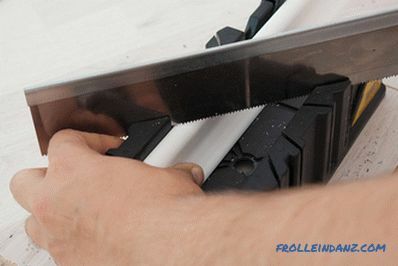 Now, setting the baseboard aside, enlarge the holes with a larger diameter drill, the size of which corresponds to the size of the plastic dowels. Remember that if you have to drill a concrete or brick wall, you should use drills designed specifically for this purpose. In addition, in order to obtain holes in similar materials, it is better to use a hammer drill having a torque control function. Tip: If your walls are made of plasterboard, you can screw in self-tapping screws directly, without first drilling holes, in the locations of the frame racks. Drilling holes in the wall. When you have finished drilling, you must use a vacuum cleaner to remove all the dust and brick / concrete chips that have formed during the operation of the drill. This moment is of great importance for your project, otherwise you will not be able to properly align, and therefore, to install the plinth correctly. Tip: It is better to drill all the necessary holes along the wall, and only then start cleaning - this will allow you to speed up the process. If you go to this step, it means that you are doing just fine, and you are on your way to completing the work. Cleaning up trash left after drilling. Now you have to insert the plastic dowels into the holes, then to fix the baseboard with screws. To do this you will need a wooden or rubber hammer. 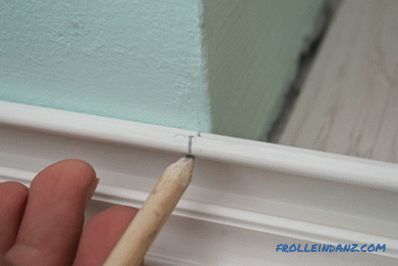 Make sure that the dowels are fully embedded in the wall, their edge should be flush with the wall surface. Finally, you can proceed to fixing the baseboard itself with screws. To speed up the process can use a screwdriver. Tip: Do not overtighten the screws, but at the same time they should not be completely twisted. 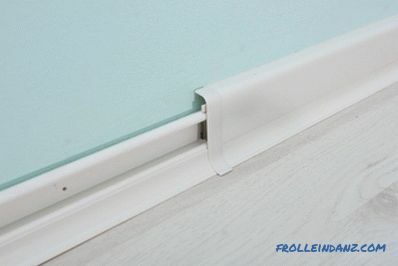 In the first case, you risk damaging the baseboard, in the second, there will be a gap between the wall and the baseboard. Fastening the baseboard with screws. After fixing the baseboard, you just have to close its decorative cover. If it is necessary to place any wires inside the plinth, you can postpone this operation until you finish the whole project. 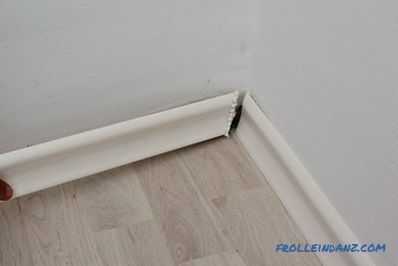 Tip: When inserting a skirting cover, do not use too much force, as you can easily damage it. Although these baseboards and designed to protect the walls, they can withstand not every impact. Installation of the skirting masking cover. 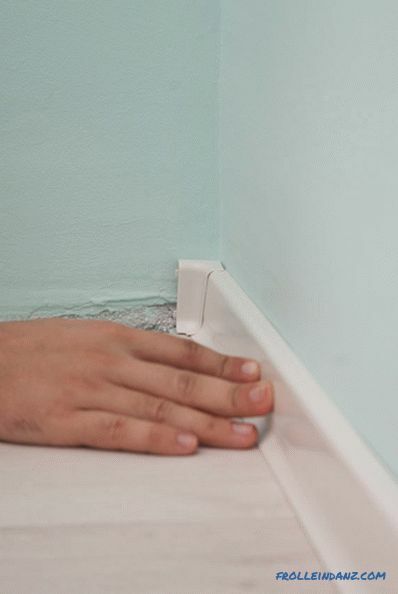 If the skirting board is shorter than the wall, you must join the two slats using a special plastic connecting element. 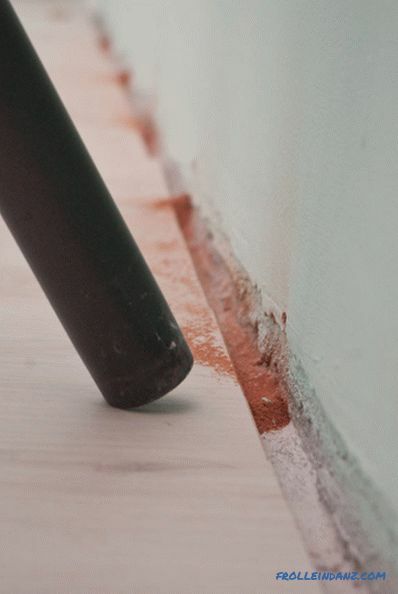 Tip: This aspect should be taken into account even at the planning stage of the work, and try to position the baseboards so that the connecting elements are in the least noticeable places. Connection of two baseboard fragments. Installing the baseboard in the corners of the room is a bit more difficult, so you need to focus to do the work at a high professional level. The first thing you have to do is mark the cutting line with a pencil. This is a more than understandable operation, so there is no need to dwell on this point in detail. Then it is necessary to saw off a fragment of the plinth of the required length, using for this purpose a shell and a hacksaw. If you wish, you can use an angle-cutting machine for this purpose, but you must first make sure that it has an appropriate disk for cutting plastic products, otherwise you will not get a quality cut. Next you need to take measurements on the other side of the corner. Just mark a well-marked line drank. Formation of an external angle. The baseboard is fixed to the wall in the same way as you did on straight sections of the wall. This means that you have to drill holes every 25 cm, insert plastic dowels and then fix the plinth using self-tapping screws. 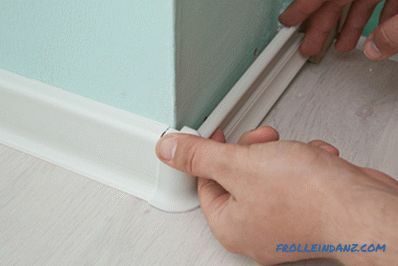 Installing sawed pieces of baseboard in place, connect them with a special plastic corner. Installation of a decorative plastic corner. 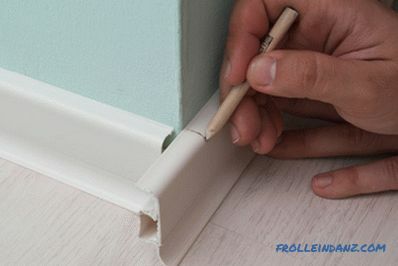 After you have installed all the pieces of plastic skirting, you must replace the cover. In principle, this operation can be managed without any special problems. 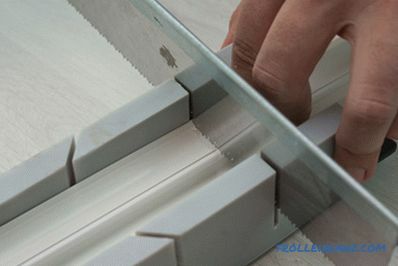 It is only necessary to ensure that there are no gaps in the joints between the two baseboard fragments between the baseboard cover and the plastic fittings. Remember that installing plastic baseboards is not difficult and does not require large expenses, but it can drastically change the look of your home if you use the right materials and tools and follow our instructions. 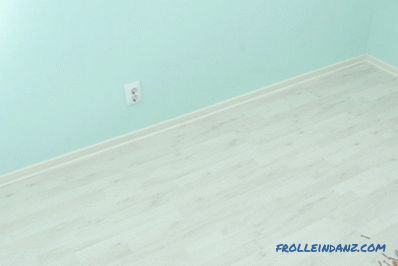 We recommend starting the installation of the baseboard from the longest wall of the room. If the baseboard is longer than the wall, you will have to cut off a piece of the right size. If it is shorter than the wall, you will need to connect two or more baseboards. In this case, you should know that their joint should be oblique. This type of joint requires cutting off the ends of baseboards at an angle of 45º and then joining them with decorative nails or glue. A cut at an angle of 45º can be made with the body. 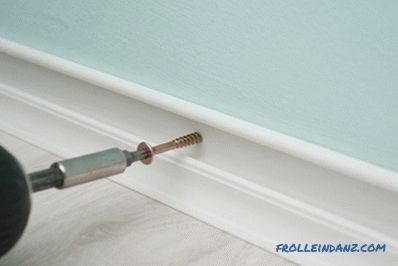 To give an already installed baseboard a neat appearance, it is necessary to fill all the gaps in the inner and outer corners, the gaps between the baseboard and the wall and the holes from nails and self-tapping screws with wood putty, and then polish the surfaces on which the putty was applied, and if necessary, repeat the procedure. 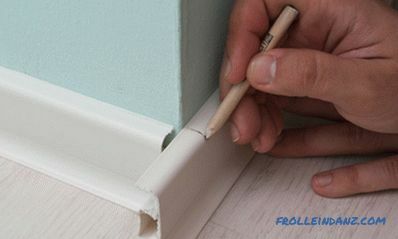 If you want to protect the flooring (in some cases, you may have to fill the gap between the baseboard and the floor), you must use masking tape, which is removed upon completion. Plinth. A miter box or machine for cutting at an angle. Measure the perimeter of the room and add 10% to the resulting figure for cutting waste. Use the trunk to create internal and external corner joints. If you need to make a drink at a non-standard angle, use material waste. You can practice on them, make a few test otpilov, until you find the right way. Use a block to get an exact cut. 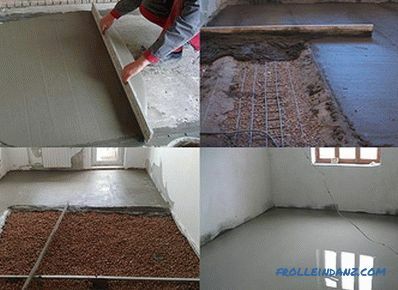 Without it, it is impossible to perform high quality work on the installation of the plinth in the area of ​​internal or external corners of the room. Place the skirting board in the box and, firmly holding it, cut at a 45 ° angle with a hacksaw. After you have finished cutting the skirting board, use medium grit sandpaper to grind the sawing area. Sawing the plinth with the help of the cloth. If you want to install the baseboards in the inner corner of the room, you must make the joint at a 45 ° angle or a blocked seam. The latter requires the use of special tools and the availability of experience, so we do not recommend it to beginners, "homemade". To connect at an angle, you must know the exact angle between the walls. In order to form a standard angle of 90 °, each of the two joined baseboards, as a rule, is sawed at a 45 ° angle. The connection of the baseboards in the corner. Measure the baseboard of the required length, and it’s better to measure not one, but two or three times, because any mistake can lead to wasted material. 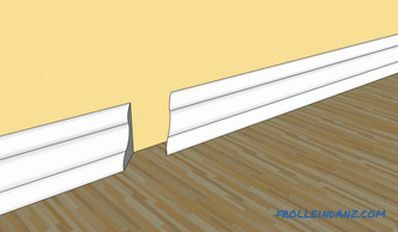 If you need to install two or more baseboards along one wall, you will have to arrange their joint, as shown in the figure. Use the block to saw off the ends of the baseboard at a 45º angle. 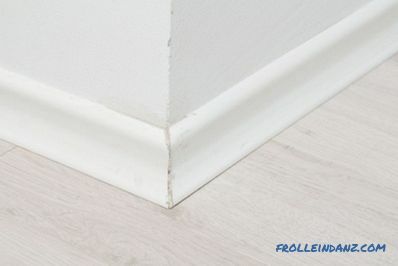 Oblique joint between two baseboards. You can use several options for fixing the baseboard: decorative nails, glue or metal clips. Metal clips fastenings go complete with MDF plinths. To fix the wooden plinths, use a hammer to hammer in the nails, being careful not to damage the baseboard during the process. We advise you to use a heterogeneity detector to make sure that you are not hammering nails into the void. Tip: Use a hand basin to drown the nail head in the tree. After you finish the job, putty all the holes from the nails and possible gaps between the wall and plinth. Installation of the plinth using a pneumatic hammer. As we have already mentioned, there are baseboards that are not mounted on nails, but fixed in special clamps (brackets). Such anchoring is usually preferable when dealing with concrete walls. To install the baseboard correctly, the clamps must be fixed at the same level, and for this you should use the water or laser level.Even a small mistake can lead to a bad result, so take the time to take all the steps with great care. 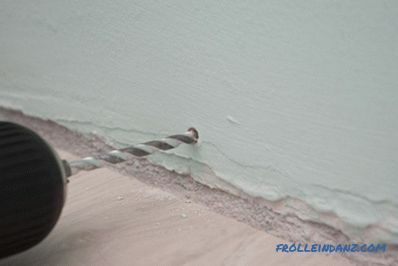 It is necessary to mark with a pencil the places where you will drill the holes, leaving about 30 cm between the marks. Drill the holes with a hammer drill or a puncher. Use a vacuum cleaner to clean the surface from dust and concrete / brick dust. Insert the dowels in the holes. The next step is to fasten the clamps using self-tapping screws, which are screwed into the dowels. We performed the last operation using a torque-controlled screwdriver, but you can also use an ordinary screwdriver, although this will require more time and effort. Fixing the baseboard on the clamps. 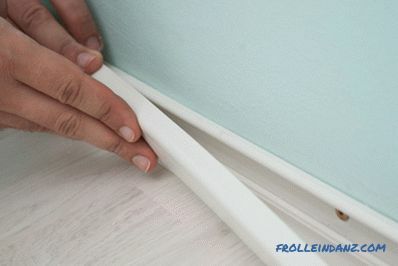 Making the connection of two baseboards around an external corner is easy enough if you use the right tools and techniques. Cut off the ends of the two baseboard fragments at a 45º angle. If there is a small gap between the joined pieces of plinth as a result of a slight deviation of the corner of the room from the direct one, you can fill it with putty. Remove excess material with a damp cloth.